“The mountains are calling, and I must go”. John Muir, Yosemite Valley 1873. 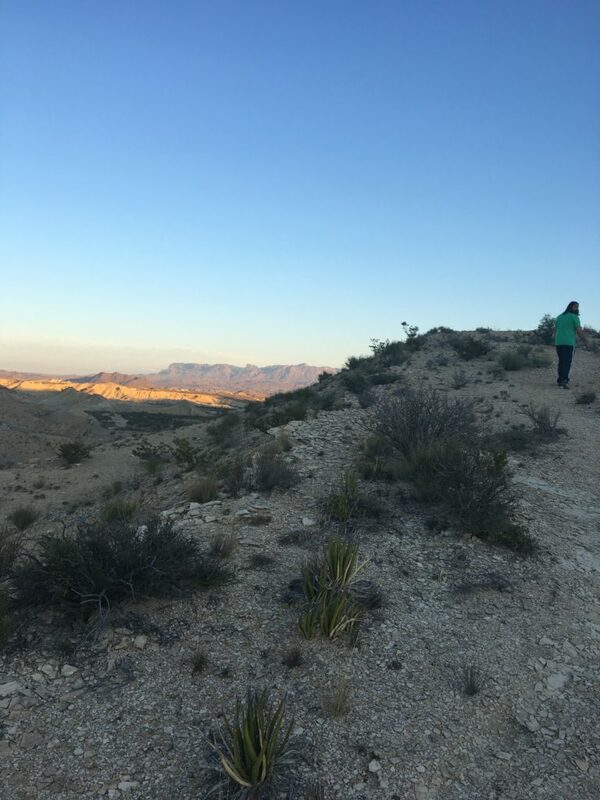 These are the words sprawled across the minty green shirts presented by my cousin for her fortieth year celebratory trip at Big Bend National Park, which have lingered periodically in my mind since returning to Austin. As I gazed docilely at my St. Ives shower bottle the morning after, the mountainous background reminded me of the natural splendor I fell witness to this past Thanksgiving 2016. 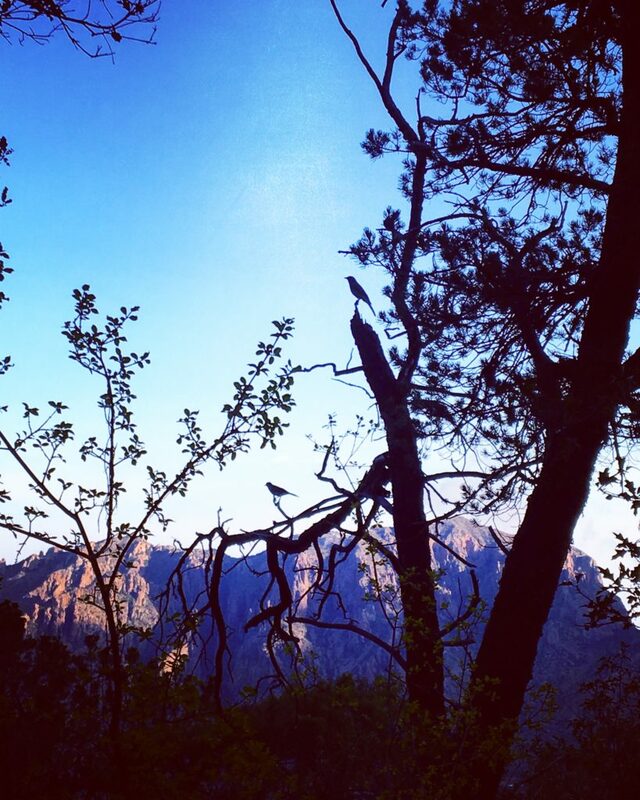 Few moments have struck me with as much awe as when confronted with nature, especially at altitude. There is an unequivocal spectacle in looking down at the earth around you, where through lack of noise you regain your voice. Inner voice in this case, with nourishment for writing through visual fuel. A recent international study revealed how more intelligent people have lower life satisfaction with higher socialization versus solitude. Regardless of cerebral leanings, we can certainly all gain something through a detachment of self from routine. As mentioned in a previous article relating to Stoic lifestyle, the phenomenon of the Overview Effect identifies this human interaction with our environment and how it transfers into our lives. Driving from Austin to Terlingua House finally demonstrated the girth of Texas for me, clocking almost 500 miles and still remaining in the same state. From living in Europe, I am no stranger to natural beauty from the Hungarian plains to the idylls of Ancient Rome however driving through vast landscapes of endless deserts and looming mountains that I had only seen in movies made a distinct impression. 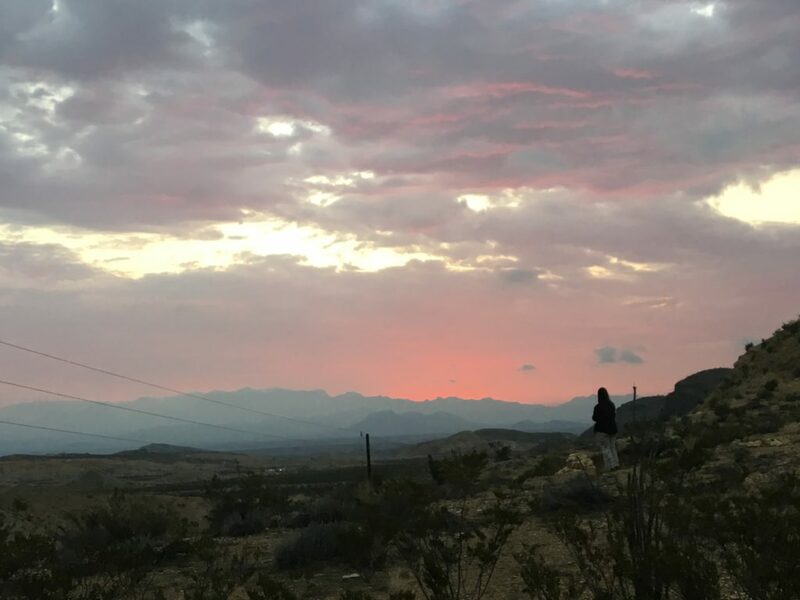 Terlingua House is conspicuously placed beyond a dusty incline behind the Last Draw Pizza parlor, about 15 minutes drive from the entrance to Big Bend National Park itself. The expansive horizon was a magnificent scene for weary travelers, accompanied by a sapphire sky and cavernous Reed Plateau backdrop. An excellent guest house for family and close friends, there was even a guard stick insect that settled comfortably on our bedroom door frame for the majority of the trip. The area had parallels with many a Western film, with occasional tarantulas crawling across the road or tumbleweed blowing across the dusty ground. The gorgeous sunrise on our window side also provided a regular pilgrimage to the hill edge for some of our party. No literature, photograph or painting can truly justify the impressiveness of Big Bend’s trails until you press your feet upon them. 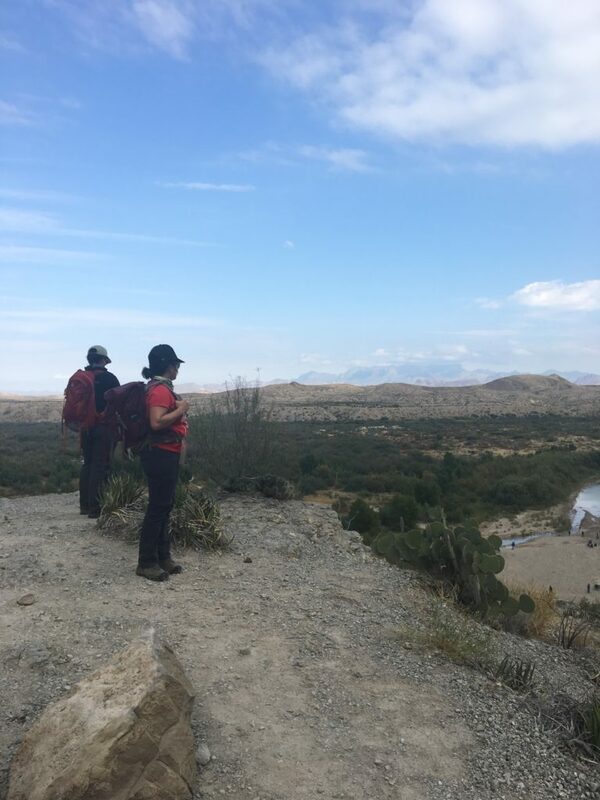 We explored 2 trails on Day 1 of 2; the Grapevines Hills Trail and the Santa Elena Canyon. At 2.2 miles, the Grapevine Hills Trail was relatively easy and crescendoed with the Balanced Rock where photo opportunities froth up. Due to the Thanksgiving traffic, a small line formed for that Instagram moment, but nothing that really detracted from the experience itself. On a somewhat overcast day, you could still gaze in awe at the Tolkien-like landscape before you. With terrain that makes your neck crane up, your playscape-loving inner-child will be sated, just watch your step and don’t risk an elaborate selfie to miss your footing. Santa Elena was a mighty switch in view from desert to river, with the opening canyon split by the 1,885 mile Rio Grande separating Mexico from the U.S. 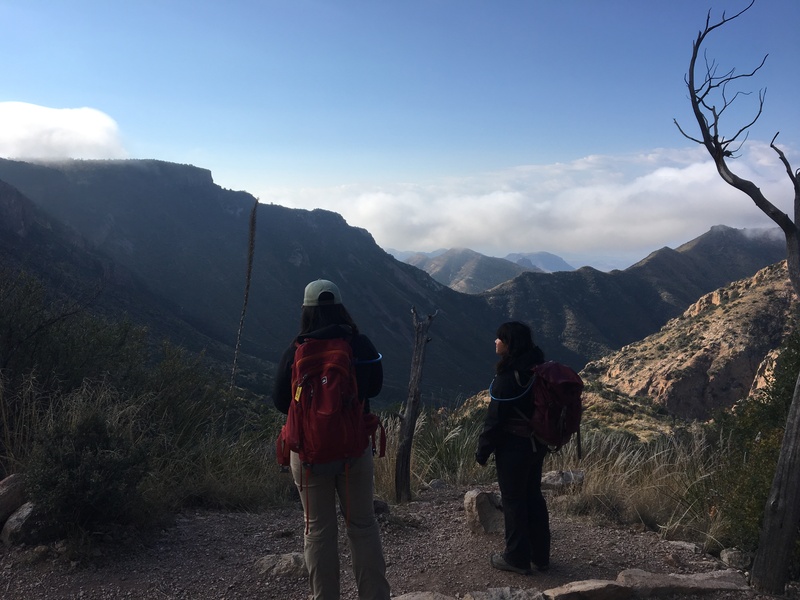 The 0.7 mile stairwell leads along the north side of the canyon, bringing you to an end point which increases in length dependent on water height. 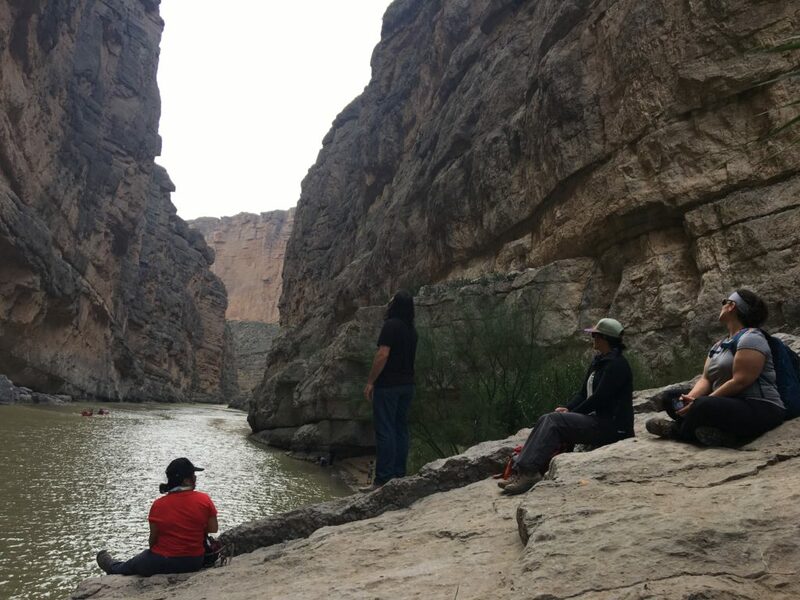 Our resting point provided more contemplative joy, with our party settling on a large smooth rock directly over the river as we stared across the Mexican cliffside. 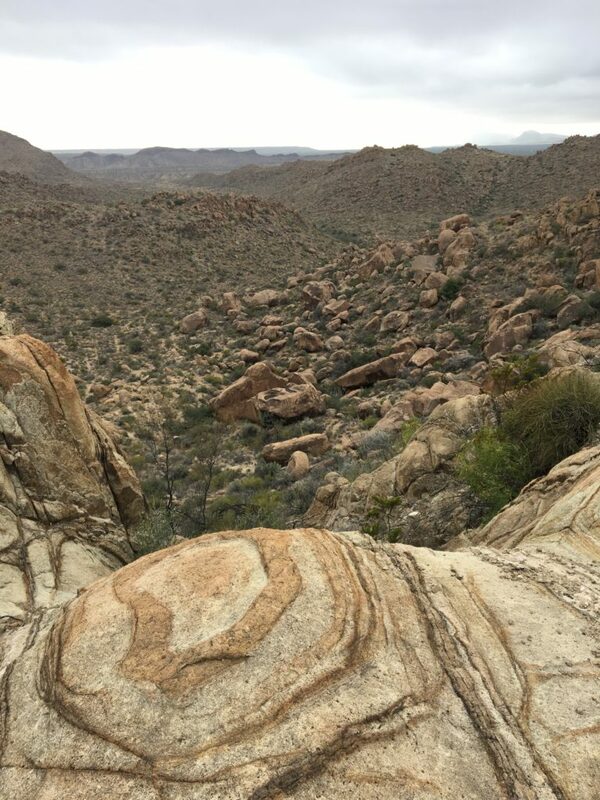 These trails merely hinted at the trail offerings at Big Bend, providing bountiful choices for desert, river or mountain. Day 2 was going to bring the South Rim Trail and at 12-14.5 miles, we left our accommodation at 5.30am to embark the more gradual ascent from the Laguna Meadows Trail. 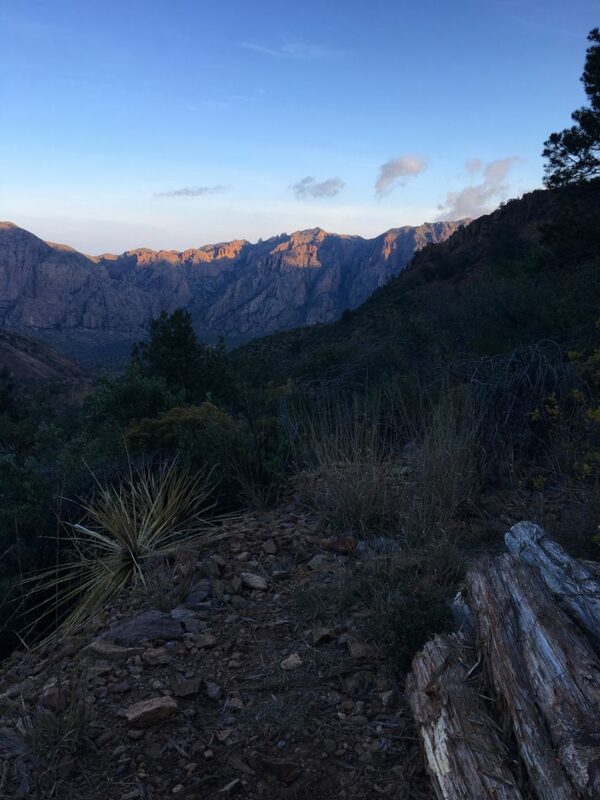 Our party of 4 strapped with headlamps were greeted by a gentle sunrise after around 5000 steps, with an absolute solitude that fed our thirst for the outdoors. 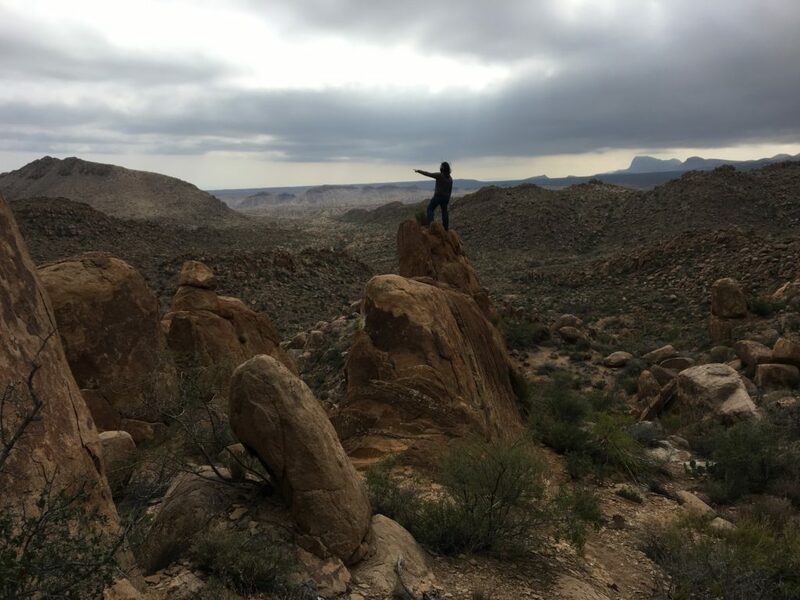 I had been considerably disconnected from digital life since halfway to Terlingua, which allowed me the peace of mind to not be concerned by notifications or texts. I was however going to take photos and videos of this hike for my own stash of meditative natural reflections. The first spectacle I noticed were the rolling clouds caressing the mountain tops above me, pouring over them like dry ice. The wind around us sounded like waves hitting the shoreline, cleansing our congested minds from a noisy year. Just when we were pondering the possibilities of seeing some of the local wildlife, a deer paused in her steps whilst looking straight at me, before rotating her gaze to jolt off with her white tail in the air. 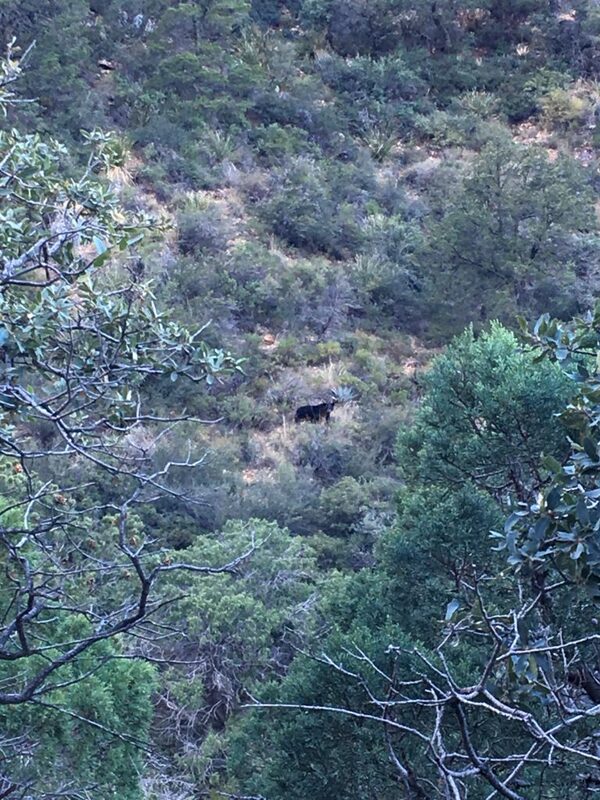 Not long after whilst we hiked one behind the other, I cast my eyes on the opposite mountainside to see a black shape I thought to be a cave entrance. A perfect bear abode I thought, before the shape turned round to stare back at me. Thankfully the black bear (that we reported later to a ranger so they can monitor numbers) was far enough for us to be safe, and left us all stunned by this momentary eye lock with the local beast. On the same day in November 2015, there were 3 bear sightings total for the whole of Big Bend so this added gravitas to our good fortune (we saw another climbed up the mountain as we left the park, so fortune favored us once again). 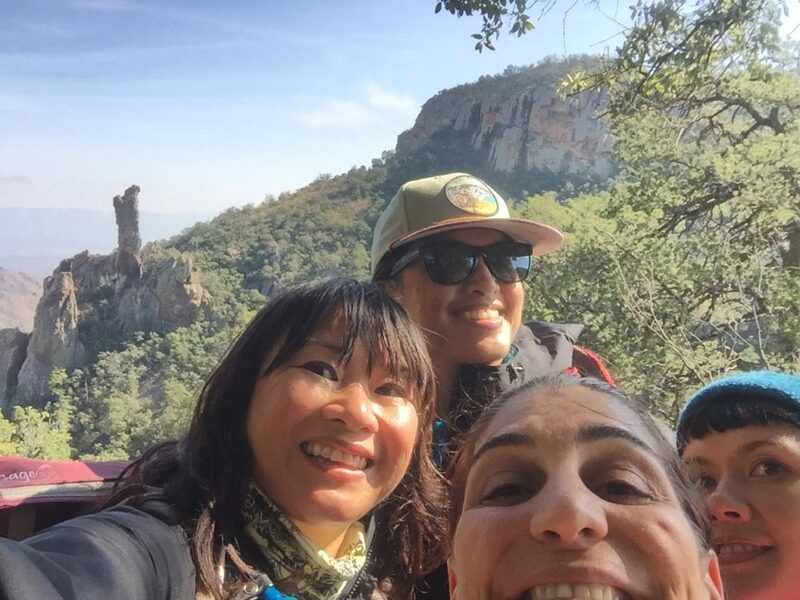 Our trek made me also consider how friendly and personable most other hikers were. At every switchback or corner where we passed another, we were met with either a ‘Hello!’ or ‘How’s your day been?’, a comforting civility when reconnecting with humanity. As we continued near the peak of our trail, the sunlight streaks across the rigid mountain faces was replaced by a cold, gloomy mist, providing an eerie isolation until we arrived at our destination. The swirling cloud had descended over the majority of the Chihuahuan desert beneath us and at a 2000 ft sheer drop from above, we could only imagine its full splendor. Nature chose to withhold the full spectacle but how could we begrudge her after all we had seen. As we began our descent, we were greeted with even more beauty from autumnal forest colors and further rock formations that breathed more life into our souls. Passing the Pinnacle rocks, we were able to capture more of the profound glory that nature brings with jubilant confidence that we were near completion of this strenuous hike. As we passed increasing numbers of hikers, even familiar faces, we left the trail with transformative smiles after the feat we had completed. The lodge offered cool respite as we toasted our journey with wine, breathing deeply whilst squeezing our sore calves. Strategic snack packing and break taking had meant we completed the loop in around 9 hours. Not bad for four women with varied hiking experience, myself only in Nike running shoes compared to the more sturdy hiking boots of my troupe. Never underestimate your capabilities when a hike is listed as ‘difficult’. Aside from some narrow and imbalanced walkways, the whole trail was clearly achievable with some planning and mental focus. That evening we regaled over the scenes we had witnessed at Starlight Theater over in Terlingua Ghost Town. 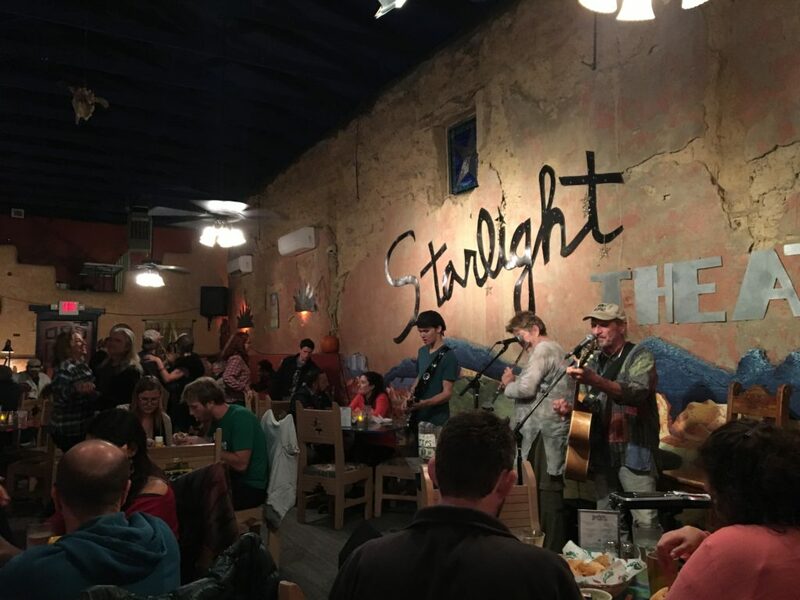 With live music and a restaurant, it was brimming with locals and visitors all united by our adoration for the incredible surroundings. For some, a few days may be long enough from home-based regimens. It was the right amount of solitude needed for most of us though, sharing gratitude for each other as well as the environment that replenished us. Who knows when we get to return, who knows when our next portion of tranquility will present itself. 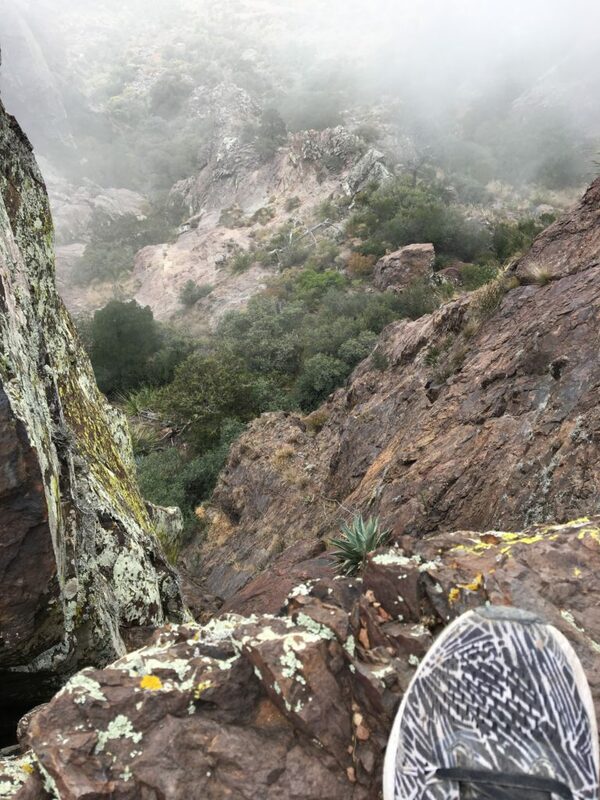 But for those that get to visit Big Bend, we can at least remember those fascinating peaks that will forever haunt our minds with their majesty.